Food for Thought! 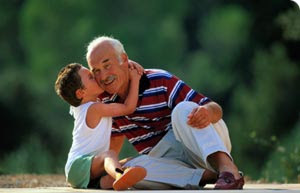 : Can you father your grandfather? It happened some 15 days back. As usual I was going to my office from home via BEST bus. You consider yourself lucky, if you happen to get a seat to sit as soon as you enter an AC bus. Its like your day is made! How, small small things can cheer you up! He asked, "Tum gujrati ho?..." I said "Nope." Then he asked series of questions about my day to day life and native place. He paused for 5 mins and said "Can you give me some work? I am useless these days because of my age. I dont have anything to do, but I want to work so that I keep myself occupied." I was awestruck. I smiled and said, "I am too small to employ you, you are like my grandfather. You should be resting." To this he said, "But I want to work." His frim words hit me hard and from that day it is pinching me. Some avenue should be created for people like him to keep them occupied and not get bored in their older age. I tried to make up something by saying that he can enquire the society in which he resides, if they need caretakers in libraries or garden or if they have home for employing old people. As I was saying that, I knew I was not making much sense. I got down at my stop, but could not really get rid of that thought. Isn't it our responsibility now to ensure that the grandpaas and the grandmaas are occupied with some work? We can't give them time, and they really dont want it. They want to do something constructive, creative at this age also. fOoD fOr ThOuGhT: Isn't it time to give them back? They ensured for our bright future, isnt it our time to ensure that they spend time doing something and not just wait for the D day to come! Any suggestions? @санжог : Thnx for the comment. Hope to see you around. A true situation faced by Indian grandparents, mostly...as v have the culture where by parents struggle hard to make things smoother 4 the next generation without giving much attention to their own interests...But what I feel is, instead of expecting anything back it is a good time in life to work out on things of interest for them which they never got time to spend for before..
Karan, its really very true and touching. The older ppl jst want somebody to talk to them and share the thoughts with the. But in a city like Mumbai its very difficult to dedicate time for older people which is very sad. @vyasa: Nice to know about your initiative. Thnx for the guidance! My dad is about to retire in two months and he goes blasphemous thiking about his days after he retires, he has been counting days since the time he knew his retirement is closing in. He keeps asking me to find him a job, any job, need not pay him too much but something that keeps him occupied and not make him feel like a burden to the society. I have inquired and there are places where they take retired people for employees, but with 1001 conditions and there are not a very huge number of places either. Alternatively, we can ask them to take classes in their area of expertise, do MLM - they meet a lot of people and they get to talk a lot - which comes as a habit after a point in time, when they realise communication is all it takes to be closer. They can also form hobby or interest groups or clubs with setting up libraries, teaching, touring, etc...that creates a sense of achievement as well as nurturing friendships that they have ignored for most of their lives - giving work priority. These kind of associations can be created by entrepreneurs too, who are not highly money driven. @Dee: Yes, networking and hanging out with like minded people seems to be an answer but not solution. I guess you concluded with a valid point! Any person with entrepreneur skills can surely take some action and start something real good!